Narrow or wide attribution window, which one you should use? Why should you use ‘1 day click’ attribution window for your analysis? Why does Facebook exaggerate the performance of its ad campaigns? 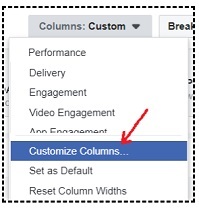 Should you optimise all your Facebook ads for ‘1 day click’ conversion window? Have you ever wondered, why the sales data reported by Facebook Ad Manager do not match with the Facebook sales data reported by Google Analytics? Have you ever wondered, why Facebook tend to record far more conversions (Sales, Leads, Signups, Add to Cart etc) than Google Analytics? Have you ever wondered, why all those smashing sales and ROAS (Return on Ad Spend) reported by Facebook Ad manager, do not really improve your business bottomline? The answer is the default attribution window used by Facebook and your misinterpretation of the Facebook attribution data. 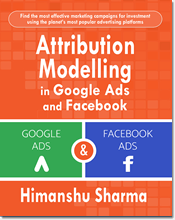 Before you start analysing, optimizing and reporting on Facebook marketing campaigns, you need to spend some time in understanding how Facebook attribution works. Otherwise you will misinterpret data, make wrong marketing decisions and loose tons of money. An attribution window is the time period (measured in days) for which Facebook will attribute conversion(s) to an ad click or ad impression. Facebook Ads Manager provides one ‘click and view attribution window’ called the ‘28 day click and 1 day view’. This is also the default attribution window of Facebook. 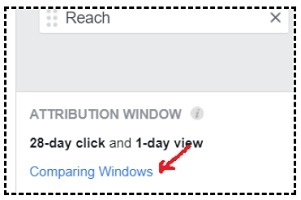 The default attribution window used by Facebook is ‘28 day click and 1 day view’. The 28-day click and 1-day view attribution window means that Facebook attributes all conversions (sales, leads, ‘add to carts’ etc.) that occurred on your website to the last Facebook ad click, provided that the conversion(s) occurred within 28 days from the last ad click. Facebook also attribute conversion(s) to the last Facebook ad impression, provided the conversion(s) occurred within one day from the last ad impression and no other Facebook ad was clicked in the last 28 days. 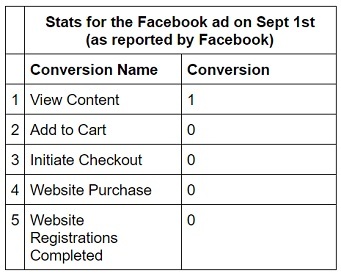 ‘1 day view’ attribution window means, Facebook attribute all conversions (Sales, Leads, Add to Cart etc) that occurred on your website to the last Facebook ad which a person saw (but not clicked), provided the conversion(s) occurred within 1 day from the last ad impression and no other Facebook ad was clicked in the last 28 days. 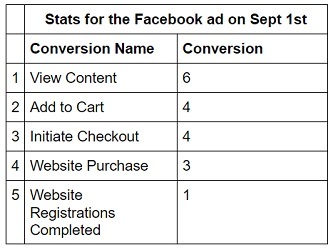 ‘7 day view’ attribution window means, Facebook attribute all conversions that occurred on your website to the last Facebook ad which a person saw (but not clicked), provided the conversion(s) occurred within 7 days from the last ad impression and no other Facebook ad was clicked in the last 28 days. 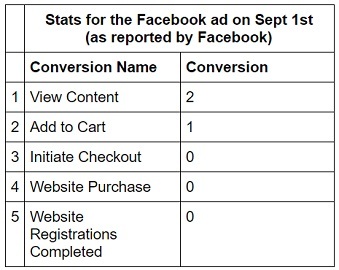 ‘28 day view’ attribution window means, Facebook attribute all conversions that occurred on your website to the last Facebook ad which a person saw (but not clicked), provided the conversion(s) occurred within 28 days from the last ad impression and no other Facebook ad was clicked in the last 28 days. Note: View attribution windows are also known as ‘view-through’ attribution windows. ‘1 day click’ attribution window means, Facebook attribute all conversions that occurred on your website to the last Facebook ad click, provided the conversion(s) occurred within 1 day (24 hours) from the last ad click. In other words, all conversions that occurred on your website in the next 24 hours after the last Facebook ad click will be attributed to the last ad click. Here is one caveat here. Facebook will attribute only those conversions to the last ad click which it can track via Facebook pixel, Facebook SDK or Offline Conversions. 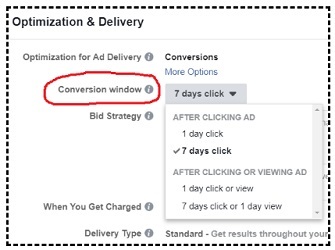 ‘7 day click’ attribution window means, Facebook attribute all conversions that occurred on your website to the last Facebook ad click, provided the conversion(s) occurred within 7 days from the last ad click. In other words, all conversions (that you are tracking via Facebook pixel, Facebook SDK or Offline Conversions) that occurred on your website in the next 7 days after the last Facebook ad click will be attributed to the last ad click. ’28 day click attribution window’ means, Facebook attribute all conversions that occurred on your website to the last Facebook ad click, provided the conversion(s) occurred within 28 days from the last ad click. In other words, all conversions (that you are tracking via Facebook pixel, Facebook SDK or Offline Conversions) that occurred on your website in the next 28 days after the last Facebook ad click will be attributed to the last ad click. Note: Click attribution windows are also known as ‘click-through’ attribution windows. How to view and compare different attribution windows in Facebook? Did you note the massive difference between website sales amount for different campaigns under different attribution windows? Did you note the massive difference between view through and click through sales for different campaigns? Did you note the massive difference between ‘return on ad spend’ (ROAS) for different campaigns under different attribution windows? Did you note the massive difference between view through and click through ROAS for different campaigns? Did you note the massive difference between sales volume for different campaigns under different attribution windows? 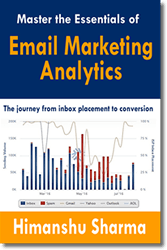 Did you note the massive difference between view through and click through sales volume for different campaigns? Did you note the massive difference between ‘cost per website purchase’ for different campaigns under different attribution windows? Did you note the massive difference between view through and click through ‘cost per website purchase’ for different campaigns? Did you note the massive difference between results (add to cart, purchases, searches, content views etc) for different campaigns under different attribution windows? Did you note the massive difference between view through and click through results for different campaigns? The wider you make your attribution window, the more credit Facebook is likely to take, for all the conversions that occurred on your website. For example, if you use the ’28 day click attribution window’ then Facebook will take credit for all the conversions that occurred on your website up to next 28 days after the last ad click. But if you use the ‘1 day click’ attribution window then Facebook will take credit for only those conversions that occurred on your website within 1 day after the last ad click. So if you are heavily involved in multi channel marketing (advertising via multiple marketing channels: SEO, paid search, email, twitter, YouTube etc) and you use a very wide attribution window (like ’28 day click’ or ’28 day view’) then there is a very high probability that Facebook will take 100% credit for all those conversions which are heavily influenced and/or completed by other marketing channels. Compare the website purchase conversions value under the default attribution window (28 day click and 1 day view) with the website purchase conversions value under ‘1 day click’ window. You are likely to see huge discrepancy between the conversion values under different attribution windows. Can you spot the day and night difference between $143k sales and $12k sales? Can you spot the day and night difference between 22.71 ROAS and just 1.94 ROAS? Majority of marketers who rely on the default attribution window will conclude that these Facebook marketing campaigns are extremely profitable. The ROAS of 22 is unheard of, in the marketing world. There is a very high probability that Facebook is taking more conversion credit than it deserves. Let me explain this concept with an example. 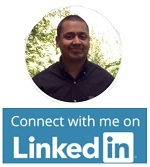 Sept 1st – Person ‘A’ saw your Facebook remarketing ad. He clicked on the ad but did not add an item to his shopping cart or initiated checkout. Sept 10th – The person ‘A’ saw one of your Google paid search ads. He clicked on the ad, added an item to his shopping cart but did not initiate checkout. Sept 15th – The person ‘A’ clicked on one of your Google remarketing ads, added an item to his shopping cart and then made his first purchase. Sept 20th – The person ‘A’ returned to your website via Google organic search, added an item to his shopping cart and made his second purchase. Sept 26th – The person ‘A’ returned to your website via Twitter, added an item to his shopping cart, initiated the checkout but did not make his third purchase. However he did sign up for your newsletter this time. Sept 27th – The person ‘A’ returned to your website via Google organic search and made his third purchase. He did not add any new item to the shopping cart. 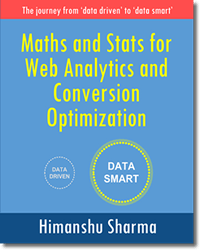 Now let us understand, how Facebook and Google Analytics attribution will work for this conversion path. Google Analytics will not attribute the ‘add to cart’ event to Facebook. It will attribute the ‘add to cart’ event to Google Ads. FB and GA Attribution – Now Facebook will attribute the sale to that Facebook ad which person ‘A’ saw and clicked on Sept 1st (this is because the sales happened within 28 days of the last ad click). Facebook will also attribute ‘initiate checkout’ and another ‘add to cart’ conversion to the Facebook ad. Google Analytics will not report any sale from the Facebook ad on Sept 15th. Instead it will report one purchase from Google Ads. It will also attribute an ‘add to cart’ event to Google Ads. Google Analytics will not report any sales from the Facebook ad on Sept 20th. Instead it will report one purchase from Google organic search. It will also attribute an ‘add to cart’ event to Google organic search. 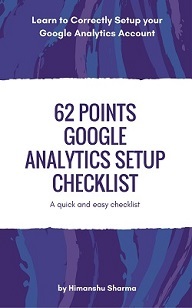 Google Analytics won’t report any newsletter sign up from the Facebook ad on Sept 26th. Instead it will report one newsletter sign up from Twitter. All of the conversion data that you see here is for just one person, who clicked on your Facebook ad just once, about a month ago. Does it look like, Facebook has claimed the conversions fairly? Now consider the hundreds and thousands of people who click on your Facebook ads only once or twice and then complete conversions on your website over the next 28 days via different marketing channels. Facebook will most likely take 100% of the credit for all these conversions under the default attribution window. If you are heavily involved in multi channel marketing, use a narrow attribution window (preferably 1 day click and 1 day view) for the analysis of your Facebook marketing campaigns. However, if all you do in terms of paid advertising is Facebook then stick with the default attribution window of ’28 day click and 1 day view’. Facebook view-through conversions do not mean much for multi-channel marketers for wide attribution windows (like 7 days view, 28 days view). A view-through conversion is the conversion attributed to the last Facebook ad a person saw (but not clicked) before completing a conversion on your website. The viewing of an ad is called an impression. According to Facebook, an impression is counted the moment a Facebook ad enters the screen of a desktop browser or mobile app. Now considering half of the world (at least the western world) is on Facebook and millions of people visit Facebook every day/week, there is always a very high probability that your target audience was on Facebook and was served one of your ads (but did not click on it) before he made a purchase on your website. All these view-through conversions could be claimed by Facebook under its view through attribution windows. However we can not completely discount view through conversions from Facebook. So in order to stop Facebook view through attribution windows from taking too much credit for conversions, use the narrowest view through attribution window available i.e. the 1 day view attribution window. Facebook can count many users’ activities as ad clicks. What that means, if say person ‘A’ like your ad on Sept 1st (but did not visit your website) and then made a purchase on your website after 2 weeks then Facebook will attribute the sale to the Facebook Ad, person ‘A’ liked on Sept 1st under its click attribution windows. So an ad click (reported as ‘link click‘) does not always result in taking people off Facebook-owned properties (like Instagram) and to your website. However an outbound click does not always result in landing page view. This could happen if people left your landing page before it is fully loaded. If you see a big gap between the number of outbound clicks and the number of landing page views, it could be a sign that there’s a problem with the performance of your landing page. May be your landing page was/is down or taking forever to load. You should always compare ‘link clicks’ metric to ‘outbound clicks’ and ‘landing page views’ metrics to see, how often people who clicked on your ad actually visited your website. Chances are, there are always going to be much higher link clicks than landing page views. It is not really fair for Facebook to take credit for conversions just because someone ‘liked’ or ‘commented’ on your ad even without visiting your website. But that’s just another way, Facebook is able to claim lot of sales and other conversions. 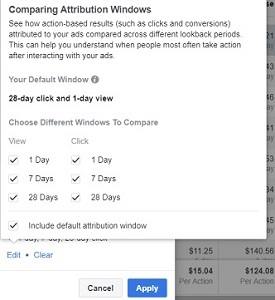 Facebook can record and report on far more conversions when you rely on its default attribution window of ‘28 day click and 1 day view’. Once a person has clicked on any of your Facebook ads then any conversion that occured on your website in the next 28 days by the same person, will most likely be attributed to the last Facebook ad click. Similarly, once a person is served one of your Facebook ads then any conversion that occured on your website in the next 24 hours by the same person, will most likely be attributed to the last Facebook ad impression. It doesn’t matter whether the person returned to your website via another marketing channel or non-Facebook ad campaign or whether another marketing channel(s) actually influenced the person’s’ buying behaviour or closed the sale. No matter which marketing channel closed or heavily influenced the sales, that sale will still most likely be attributed to the last Facebook ad click or ad impression. Facebook attribution model completely ignore the role of all other marketing channels in a customer’s conversion path when attributing sales and other conversions. So if you are heavily advertising via multiple marketing channels (Twitter, Email, Google Ads etc) and you start running Facebook marketing campaigns then within few weeks, you will most likely notice, a dramatic surge in sales and ROAS reported by Facebook. Which will give you the impression that Facebook advertising is very profitable and you should invest more in it. What is happening here is, that Facebook is taking all the credit for sales and conversion which are closed and/or heavily influenced by other marketing channels. If all you do in terms of paid advertising is Facebook then most likely you won’t see any dramatic surge in Facebook sales and ROAS when you start running your Facebook marketing campaigns. Then most likely, you won’t see smashing sales and incredible ROI from Facebook ads. Then most likely, you will see the true performance of your Facebook campaigns. You also don’t need to worry about different attribution windows. Just stick to the default attribution window and you should be just fine. You may have noticed in the examples above that unlike Google Analytics, Facebook does not always report conversions on the day they occurred. So if you run a report for Sept 1st when person ‘A’ visited your website (after clicking on your Facebook ad) but did not add an item to the shopping cart or initiate checkout, Facebook will not report any sale. But if you run the report for Sept 1st on Sept 15th when the person ‘A’ made first purchase on your website then Facebook will report that 1 conversion occurred on Sept 1st. Though the conversion actually took place on Sept 15th. Facebook will not report any conversion on Sept 15th. Similarly, if you run the report for Sept 1st on Sept 20th when the person ‘A’ made second purchase on your website then Facebook will report 2 conversions on Sept 1st. Though the conversion actually took place on Sept 20th. Let us suppose that you are looking at last one month data in your Facebook Ad Manager account. Now you saw 438 website purchases on Aug 1st. Does that mean, 438 purchases resulted from a Facebook campaign on Aug 1st? These are not single day purchases. Most likely these are the website purchases which occurred within 28 days after the last click on your Facebook ads. So Facebook count conversions on the day an ad was last viewed or clicked and not on the day when the conversion actually happened. 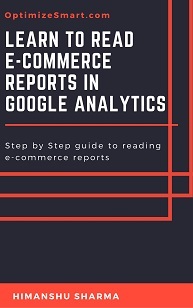 Remember that because Google Analytics count conversions on the day it occurred. So when you are comparing Facebook and Google Analytics Sales data they are likely not going to match for a particular day (unless you use the ‘1 day click’ attribution window). You should wait for your chosen Attribution Window to expire before you start reporting the performance of your Facebook marketing campaigns to your client/boss. This is because Facebook continue to attribute conversions to the last ad click / view until the attribution window expires. So you may not see any sale attributed to a campaign for days/weeks and then after few days/weeks, you may start seeing lot of sales being attributed to the same campaign. For example, if you are using the default attribution window then you should ideally wait for full one month, so that Facebook get enough time to attribute all sales and other conversions to your ad campaigns. Similarly, if you are using the ‘1 day click’ attribution window then you should wait for at least 24 hours, so that Facebook get enough time to attribute all sales and other conversions to your ad campaigns. Why you should use ‘1 day click’ attribution window for your analysis? #1 ‘1 day click’ attribution window is the narrowest window you can get. So relatively, it is going to take lot less credit for conversions which are often completed by other marketing channels. #2 Google Analytics uses the ‘1 day click’ attribution window to report on Facebook sales. If you use the ‘1 day click’ attribution window then your Facebook Ad Manager sales data is most likely to match your Google Analytics Sales data for Facebook. It may not be an exact match but should be a close match. So if you are expecting to see $143k in Sales (based on 28 days click and 1 day view attribution window, see the screenshot above) from Facebook in Google Analytics then best of luck. Because that is not the actual sales from Facebook and Google Analytics is pretty good in figuring that out. 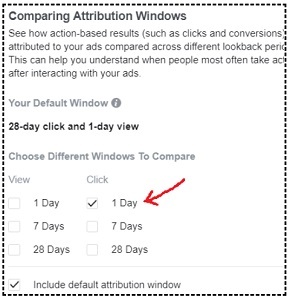 So consider using the ‘one day click’ attribution window when analyzing the performance of Facebook campaigns (provided you are doing multi channel marketing) . But don’t stop your analysis right there. You also need to take ‘view-through’ conversions from Facebook into account. Why you should use ‘1 day view’ attribution window for your analysis? #1 ‘1 day view’ attribution window is the narrowest window you can get among all available ‘view through attribution windows’ in Facebook. So relatively, it is going to take lot less credit for conversions which are often completed by other marketing channels. #2 Google Analytics can not report on ‘view-through conversions’, as they do not result in a visit that can be attributed to Facebook. All such visits are either reported as direct traffic or branded organic search traffic or traffic from some other marketing channel. Remember that the Facebook advertising is also creating a ‘demand’ for your product/service. And this demand can result in lot more direct and branded organic search traffic and sales on your website. The only way to measure such impact is to take ‘view through conversions’ into account while calculating ROI. We can not discount them completely and assume they do not exist and have zero impact on sales and other conversions. It is important to note that the assisted conversion value for Facebook, as reported by Google Analytics does not take Facebook view-through conversions into account. Google Analytics does not report on impression assisted conversions (conversions assisted by Facebook ad impressions) for Facebook. It only takes Facebook click assisted conversions (Conversions assisted by Facebook ad clicks) into account, where people clicked on one of your Facebook ads in their conversion path. Is there a vested interest? Facebook wants businesses to spend more money on their marketing platform. And when businesses see very good ROAS they are likely to invest more. However Facebook is not going out of its way to take the credit of all the conversions occurred on your website. The Facebook attribution window is no different than the attribution windows used by other marketing platforms like Google. If anything, the Facebook attribution window is in fact shorter than the 30 to 90 days long attribution window used by Google. 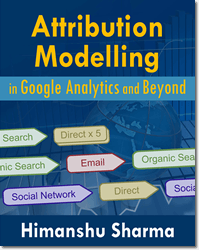 Most marketing platforms have got around a month long attribution window. But here is one big massive difference. Unlike any other marketing platform out there, people are most likely to be on Facebook, almost every single day. May be multiple times every day. So Facebook default attribution window is much more likely to claim credit for all the conversions that occurred on your website. It is just the nature and size of the platform that results in nearly all the sales being attributed to Facebook ad campaigns. Conversion window is not the same as attribution window. Conversion window is the time frame you give to your Facebook pixel to learn and optimise your ad sets for maximum possible conversions and start delivering your ads as stably as possible (without performance fluctuations). For example, if you set your conversion window to ‘7 day click’ then it means, your Facebook pixel has got 7 days to learn and find as many people as possible (on Facebook) who are most likely to make a purchase on your website (or complete some other conversion) after clicking or viewing your ad. Similarly, if you set your conversion window to ‘1 day click’ then it means, your Facebook pixel has got 1 day to learn and find as many people as possible who are most likely to make a purchase on your website (or complete some other conversion) after clicking or viewing your ad. Once you publish a new ad set or make a significant change to an existing once, your Facebook pixel start learning and finding as many people as possible who are most likely to convert on your website. The time frame during which your Facebook pixel learn about the best people to show your ads to is called the ‘learning phase‘. Note: You can also see the learning phase progress bar when you make significant changes to an existing ad set. This learning phase ends when your ad set received at least 50 optimisation events within the chosen conversion window from the date, the ad set was first published or significantly edited. So if your chosen conversion window is ‘7 day click’ then your Facebook pixel learning phase ends once your ad set received at least 50 optimisation events within 7 days from the date, your ad set was first published or significantly edited. Similarly, if your chosen conversion window is ‘1 day click’ then your Facebook pixel learning phase ends once your ad set received at least 50 optimisation events within a day from the date, your ad set was first published or significantly edited. This learning phase can also end when your ad set does not receive at least 50 optimisation events within the chosen conversion window from the date, the ad set was first published or significantly edited. When the learning phase successfully ends (that is your ad set gets at least 50 optimisation events within the chosen conversion window) then your Facebook pixel is in a best position to deliver and optimise your ad sets to get maximum possible conversions. When the learning phase does not successfully ends (that is your ad set does not get at least 50 optimisation events within the chosen conversion window) then Facebook does not learn to optimise your ads to get maximum possible conversions. You would know that your Facebook Pixel learning phase for a particular ad set has ended when you stop seeing the learning phase progress bar. However regardless of the outcome of the learning phase (successful or not successful), the longer you run your ads, the more your Facebook pixel learn about the people who are most likely to convert. So your Facebook pixel does not stop learning just because you don’t see the learning phase progress bar any more. Considerable change to your campaign/ad set budget. 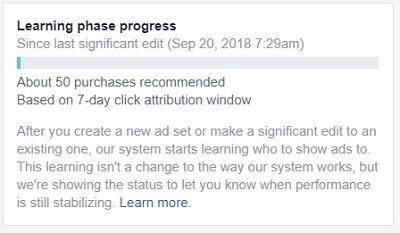 So if you keep making changes to your ad set(s) every 2nd or 3rd day then your Facebook Pixel learning phase will keep resetting and will never end. Then your Facebook pixel will never learn to find the people who are most likely to convert on your website. So once you publish a new ad set or making significant changes to an existing one, wait for a week, for the learning phase to end. And if the learning phase does not successfully ends then make changes to your existing ad set. Needless to say, conversions windows are extremely important for optimising your ad sets for your chosen conversions. I would suggest to test different conversion windows and see what works for you. While ‘1 day click’ window may be appropriate for analysing the performance of Facebook ads, it generally does not work when it comes to optimising your ad sets for conversions (unless your Facebook pixel is very mature and you are already getting 50 or more conversions a day from your Facebook ad campaigns). If you expect your prospects to make a purchase within 24 hours after viewing or clicking on your ad(s) then ‘1 day click’ conversion window may work for you. However, if there is a long consideration phase and your prospects usually take a week to complete their purchase then ‘7 day click’ conversion window is more appropriate for you. Determine the time (days) it usually takes for a person to complete a conversion (like purchase) on your website (i.e. sales cycle). Use that time frame to decide your conversion window. In my experience, the ‘7 day click’ conversion window works the best most of the time. But you should test different conversion windows to see what works best for you. Now armed with this new knowledge, go back to your Facebook Ads manager account and determine the true performance of your ad campaigns. I should have given this recommendation at the very start of this article. I often see websites with no Facebook pixel tracking or broken Facebook pixel tracking or incomplete pixel tracking. Then the website owners wonder why they can’t track the performance of their ad campaigns in Facebook Ad Manager. Then they wonder, why they can’t track sales and other conversions or why they can’t calculate ROAS. Facebook Ad Manager does not automatically report on Website Sales and other conversions. Facebook Ad Manager does not automatically report on ROAS. You would need to set up Facebook pixel tracking on your website and track all available Facebook events (esp. 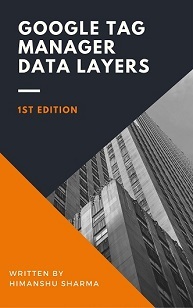 purchase event) in order to get the best possible performance data in your reports. And just setting up Facebook pixel tracking is not enough. 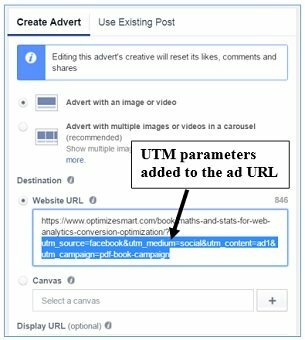 By adding the UTM parameters to the ad URLs, you can track the performance of individual Facebook campaigns in Google Analytics.